Holiday greetings to you, Friends! 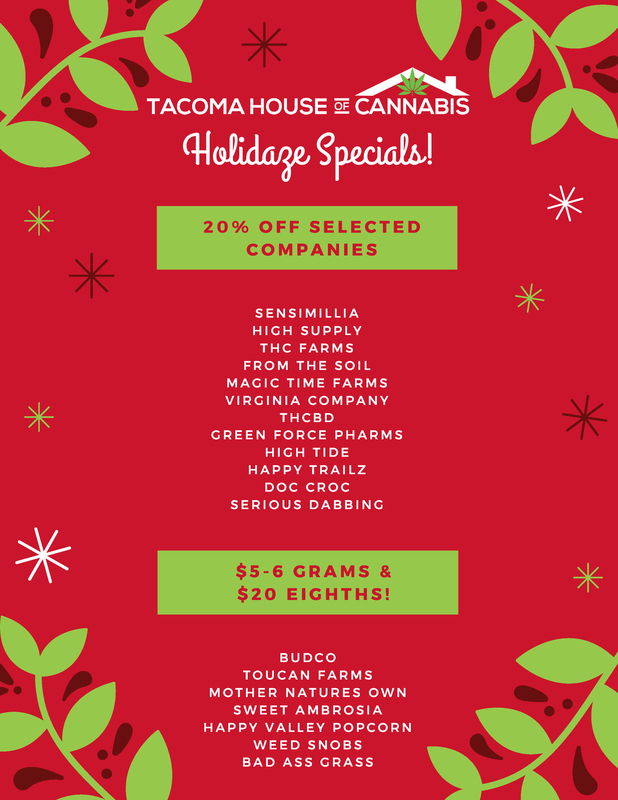 Things sure have been busy here around Tacoma House of Cannabis. We’ve been bringing you the greatest pricing available in Tacoma, Washington for a while, and just this past week spent two days meeting n ew vendors at Interchange. Interchange is a business expo that is basically a speed dating procedure for farms looking to get their products in to new stores throughout Washington State. We had a great event and have lined up several farms to bring in at Tacoma, Tonasket, and Carlton House of Cannabis. In order to make room, though, we have to clear some product out! Help us reduce back stock with DEEP DISCOUNTS on many established products, and products phasing out over the next few weeks. I’ve included our flyer below so you can target your ideal lineup in the savings. Don’t forget to place your reservation for an order online at http://menu.tacomahouseofcannabis.com so you can skip the line when you arrive. We are looking forward to seeing you! Happy Holidays!